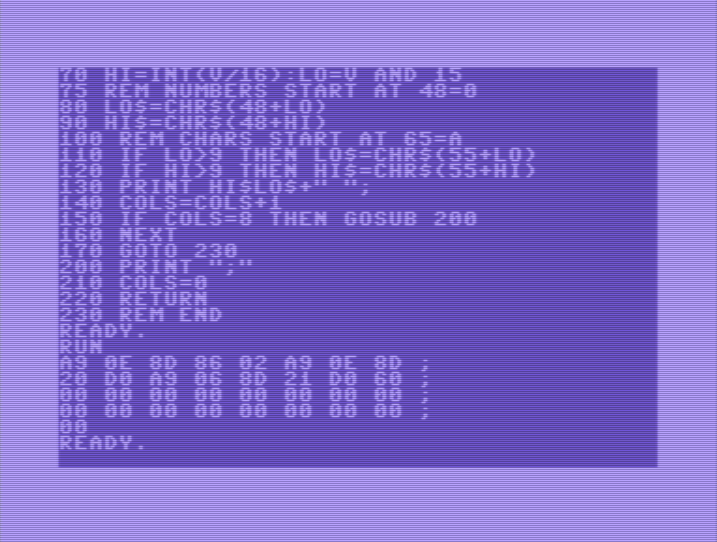 Cursor Control with Commodore 64. The ability to draw a character at any spot on the screen - within the constraint of rows and columns, perhaps, is key, when you're trying to create either a text editor, or a roguelike, or nearly anything with a text-based UI. It's apparently also impossible on the Apple I, but fortunately I'm working with something a bit more advanced. I'm not doing THAT retro. C64 Programmer's Reference Guide is fairly good. I'm not entirely sure I could have comprehended it, or would have had access to it when I was in grade school, but it's at least theoretically possible. I definitely would have been able to get this book, whether via a library or by pestering my parents sufficiently. Not sure I had the character and audacity required for such a proactive behavior, though, but meh. This sets the cursor to a specific row and column, as far as printing is considered. The SYS is required to set the row and column. You can find that in many different sources. However, it does not display the cursor. Poking at the right spot (204, 0 for enable, 1 for disable) does turn the cursor on and off, but for some reason, the cursor location is wrong. You can also do direct manipulation of screen memory by poking at locations from 1024 onwards, but unfortunately the character ROM doesn't directly map to PETSCII. 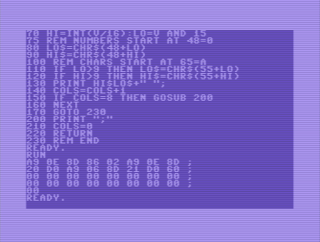 As a downside of using GET input, you do not get to benefit from the, actually rather nifty on-screen editing that is default for C64. I'm trying to create a status line, by jumping between cursor location and line 23, where I print current cursor location and... well, haven't really thought that far. Filename, I suppose. Currently I'm just putting the last key's code there. I flip editor mode on F1, of course the only command currently supported is "save", and frankly, there is no scrolling, so max document length is 25 lines, but, baby steps. print#, which is used to write to files, is also... finicky, I guess. it uses slightly different printing rules, and it differentiates between variables by CRs (char code 13), which makes it unsuited to printing numbers, unless you use some sort of string encoding. I did figure out I could save ASM files as hex strings, and loading those would be quite simple. I might use that as an intermediate step. Anyway, the various SYS commands are fortunately documented in the Programmer's Reference Guide. I am currently working with the idea that actual data is kept on known area in memory, which is then written to disk. I've already run into some issues with the memory area not being cleared, which ended up with this little bit of... fun. It's really moderately straight-forward, it should zero an area from 4096 to 5116, or so, by copying accumulator to various memory slots adjusted by x-index. it increments x-index by 1, then compares it to 255, and if it's not there yet, it jumps back 16 bytes in execution. Biggest new thing I learned was that the comparison operator jumps backwards or forwards by a specific number of bytes. Makes sense. Running the program with an appropriate sys address call, of course. There are a couple of different ways of doing byte to hex conversion and vice versa. A lookup table works fine, and is pretty concise for byte-to-hex, since the and masking and division need to be done anyway. I don't worry much about the memory limitations at this point, although they are a concern with real-world applications. My editor program is starting to reach the point where putting the screen at 4096 may risk overwriting the actual code. 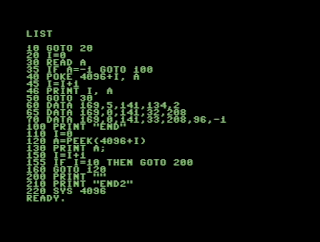 For hex-to-byte conversion, I guess you could create an array of integers of the PETSCII codes, and compare each letter to the array, recording the index of the match, but I'm not convinced it's faster than what I have here. Might use less memory, though. Basically, that's all it took. It reads in a file "quizfile" and lines that start with a q, are part of the question, a lines contain an answer, and c lines are followed by a number indicating which answer was correct. 105 print i;"lines of text"
It's not good enough, though, since you do need the ability to add new questions. It's also not the simplest possible way, since you could do the whole thing with a goto after the open in a input-print# loop until end symbol, but I often putter around, trying different things, and sometimes the solution can be messy. Well, I'm going to be compassionate towards my younger self. After all, it took me a while to figure out how to write and load from files, and an arcane syntax like "@0:" is more than a bit odd, although I think it means "start writing to the file from this location. Because, otherwise, the file doesn't save, and then, sadness. To tell the truth, I've already written a bunch of tiny practice programs. change the cursor, border and background color - in machine language, put into memory. That was the image in the last post. and a few others. However, today I wrote something potentially useful - a bit of code that dumps an area from memory to the screen in hex. Doing that is probably going to be useful, once I get into more machine language stuff, especially as I cannot pretend to own a TASM cartridge or something. What I wrote is a START, as, since it being a basic program, it's slow, AND unless I combine it with an interface to edit memory, it doesn't do that much - I can do poke-run loops, but that seems remarkably tedious. An alternate way would be to translate this to ASM, then load it to an area in memory, and then activate it via SYS calls. Still, the output looks cool. The program dumped is, naturally, the screen-color altering one from my previous post. A9 is a single-byte LDA, 8D is STA followed by a 2-byte little endian address, 60 is RTS. I suppose a sys calls is basically just a JSR, then. Yes, I possessed one of these wonderful machines, wayback. I was even interested in programming with them. Unfortunately, very little materials were available, outside a fairly good computer magazine, and my understanding was really quite poor. At some point in grade school - between age 9 and 12, I was quite into it - even if I had tried to trade my C64 for an MSX, because it had direct commands for graphics and sound. 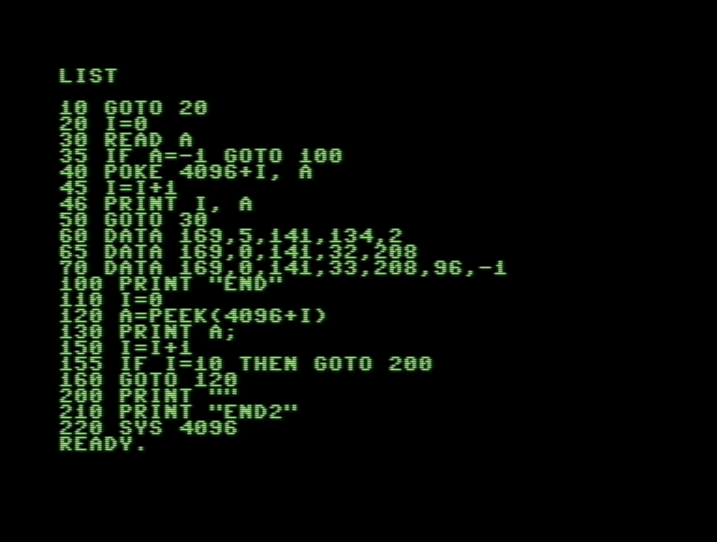 However, typing in program listings rarely worked and I really couldn't debug the programs - didn't even know how. I did try to write a trivial pursuit type question-answers game in the fifth grade, but it was just this awful mess of IF-THENs. I think I tried using DATA statements, but I couldn't quite get it to work, so I gave up on that, and the fact I even remember that, should tell you something. - I will allow for the internet, which is a bit of a cheat, admittedly, but there are chances I could have gleaned the information from a magazine. - The ! "#%¤%& game, it's engine and enough demo questions for a proof of concept. Since I'm bringing in a generation's worth of computer science knowhow, I can say that the quiz program needs to load the questions from a file on a floppy disk (or perhaps a datassette, too) instead of being hardcoded, and the questions need to be editable with (a, the) text editor. I do hope to document this, since a "How do I Basic to Macroassembler" does not seem to exist in the 'net at this point.